This kid-friendly kit lets you craft ten of your own little balls of fizz. Bubbles make everything better, so why not engineer them yourself? 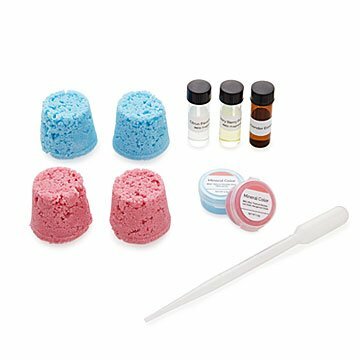 With Stacia & Robert Guzzo's budding scientist-friendly Create Your Own Bath Bomb Kit, the complexities of chemistry get a bit of a cool-kid makeover. Lessons on acids, bases, and the pH scale fit seamlessly into instructions on how to craft up to ten of your own little balls of fizz in your choice of two colors and three distinct scents — Citrus Paradise, Very Berry Fun, and Lavender Essence. Ages 7 and up. Handmade in California. We made our own bath bombs, 'cause who can resist? Read more about our quest for the perfect at-home spa experience on our blog. While living in a small city apartment during the early years of their marriage, husband-and-wife team Stacia and Robert Guzzo dreamed of a more hands-on life. They packed up their things, moved to a rural mountain town, and learned to make body care products as a way to learn a little more about what they were putting on their bodies on a daily basis. Four years later, the couple proudly owned a thriving bath and body business, and Stacia began teaching soap and lip balm-making classes. Stacia and Robert are dedicated to helping people take charge of their own skin care. Whether controlling ingredients, creating an unforgettable handcrafted gift, or sharing a unique and fun experience with a loved one, the couple believes the world is a better place when people take a hands-on approach to their lives. Set creates 10 mini bath bombs. My daughter absolutely loved this! My daughter was able to create these to her own liking allowing her to be creative and in control. Just what every teen and tween wants! My 8yo niece loved making her own bath bombs.